Note for Readers: The MyFitnessPal interface & functionality may vary depending on the device you are accessing your account from. We tried to take this account when writing these articles, but if you find yourself "stuck," don't hesitate to reach out to your M2 Coach for help. The paid version of MyFitnessPal is not a requirement for M2 Clients. Beyond the basics, the MyFitnessPal app will ask you a sleuth of questions, but don’t sweat these - they are simply a formality. Your M2PN coach will be overriding many of these settings, so just move past these questions as quickly as you can…(ESPECIALLY the question asking how much weight you want to lose per week… YIKES! 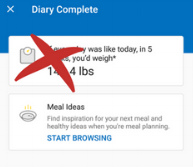 To ensure your coach is able to provide feedback on your food diary, we will need to become "friends" within the MyFitnessPal app. The "main menu" button can vary based on the type of phone/app version you have. The button is typically located on the left hand side - top or bottom, and the icon is generally 3 horizontal lines or dots. Set it to either “Friends Only” or “Public” depending on how you feel about it. Again in this section, we will be overriding the suggested "goals" that MyFitnessPal inputs, by default. While it's a great tool, MyFitnessPal is NOT a highly qualified and experienced nutrition coach, and your M2 coach takes much more into consideration when prescribing your custom goals. Once you've completed this, return to the "Calorie & Macro Goals" screen to ensure the numbers match your prescribed daily goals. **If you have any questions regarding any set-up items, don't hesitate to reach out to your M2 coach. We are happy to help! Tracking food is the main function of this app and the main purpose we use it here at M2. We know it can seem intimidating at first, but MyFitnessPal has some great features and a massive database to simplify food tracking. Our hope for this guide is to help you become comfortable & efficient tracking your daily intake. Click the blue “+” in the bottom center of your home screen OR select "diary" in your main menu. Click the orange fork and knife “food” image OR the "add food" option from diary view. Once you've selected your food item, ensure you adjust the serving size to properly reflect how much you consume. The location of the "+" varies by device. The app will default you to having 3 meals and a snack option. 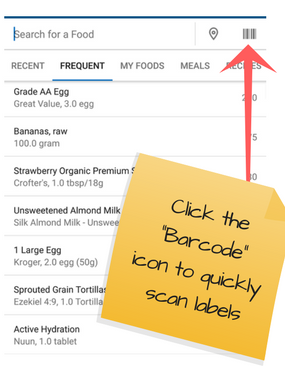 A great feature available through the MyFitnessPal app is the ability to scan the UPC label on purchased products, and if the product is pre-loaded in their system with the corresponding bar code, then adding to your diary is super easy! Tip: usually located at the top right of the screen. Another great resource within the MyFitnessPal is the ability to look up common dishes found at popular restaurants. Some of these are user inputted, but many times, you will find that popular restaurants (ie: Panera Bread, Chipotle, Chick-Fil-A, etc) have uploaded their full menus for you. Once you're at the search screen, just search the restaurant and menu item like you would any other food. We have found the restaurant search feature to be case sensitive, at times. Make sure you are very precise when searching restaurants. We have also found that many restaurants will upload their entire menu which makes logging much easier. Typically, if you search the restaurant, there is a clickable link labeled "View Menu." By clicking this link, all the uploaded food items for the restaurant should load for you. How to Track Your "Macro Budget"
Thankfully, within the MyFitnessPal app, there is a way to track your "ongoing balance" or otherwise known as the "Nutrients" tab under "Nutrition." Here, you will see the “bank account” representing your intake for the day compared to the goal you are working to meet. The blue line will adjust accordingly, representing your progress towards your daily goals, as you add food throughout the day. We encourage you to check this balance frequently throughout the day, as you plan and consume your meals to assist in your food selections. Tip: There are numerous ways to access the "nutrients" tab in the diary portion of MFP, depending on the device you are utilizing. Typically, the icon used within the app to represent this screen is a "pie chart" icon. But seriously, we have already considered your activity level in your macro prescription. While we are big advocates of logging training in general, logging activities within MyFitnessPal will modify the goal numbers you have already inputted. HEADS UP: having something like an Apple watch might also alter this, as those sorts of devices log steps and link to apps like MFP. The technology is nice, but try and keep activity out of the equation, on your end. 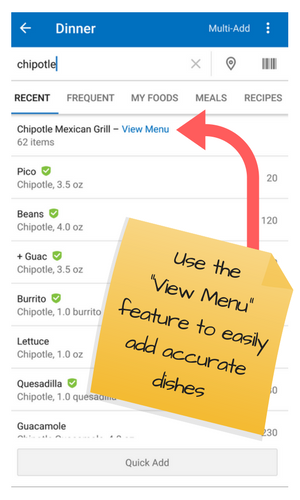 If you are someone who frequently eats the same meal and/or snacks OR if you're eating leftovers, you probably want to utilize the "copy meal" feature. 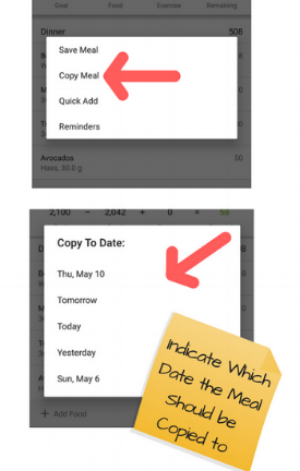 This feature allows you to essentially "copy & paste" previous meals to another day within the diary. From the pop-up menu, click "Copy Meal"
Eating the same meals and tracking with someone else? If so, then you will likely want to use the MyFitnessPal feature that allows you to copy meals from a friend's diary. You don’t have to remember to “complete entry” at the end of the day in order for your M2 Coach to see your diary. Your M2 Coach can see your information as soon as you enter it, so there is no merit to officially “completing” entry.